We owe the excavation and amplification of this sketch (which mostly consists of melody and bass line) to the indefatigable scholarship of the late Reinhard van Hoorickx. This is the second of three sketches which exist alongside the final version, or fair copy, of the work known as Didone abbandonata which dates from December 1816. This was published in 1895 in the Gesamtausgabe. A work in Italian, prepared for Salieri’s approval (the manuscript of the final version shows evidence of the old man’s emendations), is a strange phenomenon for the end of 1816; indeed, at first glance it seems a backward step for the composer. Anton Stadler states that Schubert was Salieri’s pupil between 1812 and 1814, but we know that in June 1816 the young composer took part in the celebrations for Salieri’s fiftieth anniversary. This event put the two men in touch with each other again (if, indeed, they had ever been out of contact – we simply do not know). In any case it would not have been lost on Schubert that Salieri could be a powerful ally in his efforts to find a job in an opera house (he applied, unsuccessfully as it happened, for a Kapellmeister post in Laibach in Slovenia early in the year). John Reed avers that a Metastasio setting may have been designed to appeal to one of Schubert’s prospective employers, prejudiced, as they almost certainly would have been, in favour of Italian opera. If it was designed as a musical calling-card it would make sense that it should be prepared under the benign supervision of Salieri whose advice would have been especially valuable in the matter of Italian prosody. Despite the fact that this song is an earlier stage of the final version, it has a musical character of its own. 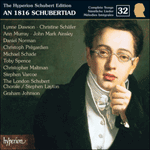 If Schubert himself had ever completed the work, he would have amplified the piano part, especially the accompaniment of the opening recitative, if the ornate final version is anything to go by, with its trilling, Baroque-style writing. 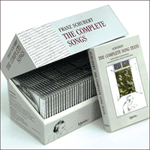 It is also clear that Schubert’s final recitative is an elaboration of the simple and concise one recorded here. The cantilena on the other hand (‘Ah, non lasciarmi, no, Bell’ idol mio’) is different enough to consider the two pieces separately. The key of F minor is common to both, and there is a middle section in the relative major in both songs, but the melodies, and the shapes of the phrases, are rather different. Hoorickx’s simple accompaniment (and Schubert’s marking of ‘Andante con moto’ rather than ‘Allegro affettuoso’) makes this music more accessible to the average singer than the final version which requires a high C and towering vocal stamina. There is more anger in the final version, a more gentle sadness here. This implies that in preparing the final version Schubert started with a core of melody and harmony – vocal line plus bass – and then gradually changed it, dressing it up in more showy and dramatic clothes. This suggests the rather self-conscious act of crafting a piece, and titivating it as a showcase for his abilities. In this earlier version we probably have the music that occurred to the composer spontaneously, at the point he first responded to the words, and before he began work on turning it into something more characteristically Italian. If this music is less showy than Didone abbandonata, it can also appear less of a pose, more heartfelt. There is a similarity to Haydn’s Arianna a Naxos, and Schubert’s possible debt to that work. Haydn’s cantata, about another abandoned woman, also begins with a noble recitative in E flat, and concludes with a passionate aria, also in F minor. The similarities between the pieces, both devoted to wronged women from classical mythology, seem too great to be coincidental. Vedi quanto t’adoro ancora ingrato. Ed hai cor di tradirmi? See how much I love you, ungrateful man! you remove all my defences, and disarm me. Do you have the heart to betray me? And then to leave me? as I said farewell to you.